I have used Certo ever since I started making jams and jellies when I first attended the University of Waterloo, Ontario, in the late seventies. I moved back to England, home of my birth, in 1984 and got back to jamming in early 1992 as, after I had my second son , I had time and cute little baby food jars on my hands. Glass recycling was then a thing of the future. I bought a book on preserving for 25 pence- 50 cents at the time, costed the ingredients and started by making Seville marmalade, with Certo, of course! 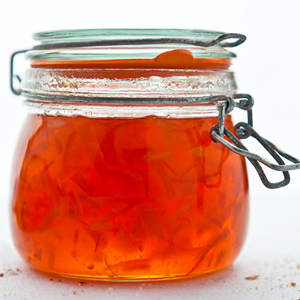 My marmalade became a real favourite with friends and family. I progressed onto strawberry and blackberry jam with fruit picked from farms and hedgerows and again shared the results of my efforts. Soon I became inundated with lovely, clean jars delivered by smiling pals who hoped to have one or two returned full. I have made thousands of jars of jam, jelly and especially marmalade over the years- always using Certo and your recipes because the results are consistently excellent. Now I have a small Bed and Breakfast business at home and guests love my homemade preserves, especially my marmalade. Overseas guests often buy a jar or two to take back as a memento of their travels. I, and you, should take that as a real compliment. When asked, I always tell people I use Certo. If you could send a loyal customer any coupons or vouchers, that would be lovely, but I wanted to let you know how much I valued your product. PS Love the new look website. Thank you to Joanna for this amazing poem! Oh how clever – no failures yet! Certo is awesome – remember the name! Paddington the movie prompts surge in Certo sales! Sales of liquid pectin – the gelling agent in fruit jam – are massively up, with manufacturers pointing to Paddington bear as inspiring a homemade marmalade movement.